Knaresborough Town will travel to Albion Sports for their first ever NCEL Premier Division fixture. Having been promoted from Division One as champions last season, the Manse Lane outfit begin the 2018/19 campaign on Saturday, August 4 and boss Paul Stansfield says that his players cannot wait for the clash. “We’re not going to get too caught up in the fact that it’s our first game at this level, we’re looking forward to it, but we just want to come away with three points,” he said. “It’s not a bad fixture first up, they’re a pretty solid team so it will be a good test of where we are. Stansfield and his troops have two big local derby encounters with neighbours Harrogate Railway to look forward to this season. They are scheduled to make the short trip to Station View on December 1, then play host to the Starbeck outfit on April 13. “These derby fixtures will definitely be good for football in the local area, they should attract a lot of interest and hopefully good crowds,” Stansfield added. “We’ll treat each one as just another game where we go out and try and get three points on the board, but I’m sure it will be lively. “The fact that we are plaing in the same division as Railway is a sign of just how far Knaresborough Town has come as a club. “Only four of five years ago we were playing four levels beneath them in the West Yorkshire League while they were challenging for an Evo-Stik Division One play-off place under Billy Miller. 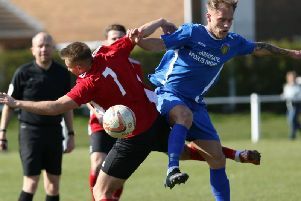 Boro continued their pre-season preparations with a 1-1 draw against Whitkirk Wanderers on Saturday before beating Pickering Town 4-1 in midweek. The Pikes were promoted from the NCEL Premier at the end of last season and into the Evo-Stik League, leaving Stansfield delighted with the victory over higher-tier opposition. “We played really well against a good team,” the Town chief added. “I reckon eight of their starting line-up would probably be in their strongest side, so that’s very pleasing. “They made a lot of changes at half-time, but then so did we. We were excellent from minute one and controlled the game. You get a bit of a buzz when you pull off a result like that, even though we know it’s a pre-season friendly. Nick Black, Ben Parkes, Dan Clayton and Dan Thirkell (penalty) were the men on target in the triumph over Pickering, while James Purkis scored Boro’s goal against Whitkirk.